Put the cookies in a food processor and process until they become fine crumbs. Set aside. Assemble in the ungreased 9x13 inch pan in layers as follows: first layer, 1/3 cookie crumbs; second layer, 1/2 pudding mixture; third layer, 1/3 cookie crumbs; fifth layer, 1/3 cookie crumbs. 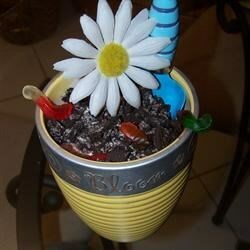 Fool 'em with a fun cake that looks just like a flower pot.